This home was part of the 1933 Chicago World's Fair Century of Progress Homes of Tomorrow exhibition and was given the name the Good Housekeeping Stran-Steel Home. 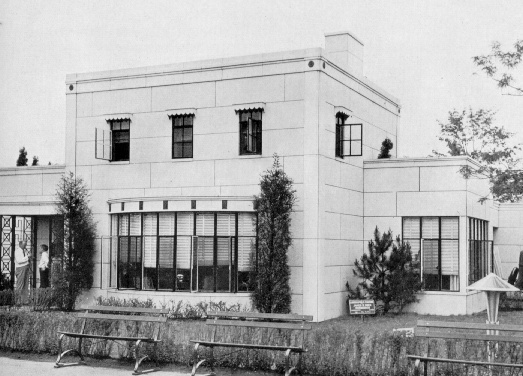 In 1934, it was purchased by real-estate developer, Robert Bartlett, and transferred to Palos Heights where it stood until 1992. In spite of community efforts to move the home, it was was torn down to make way for urban development. This unusual art deco design was commissioned by Good Housekeeping magazine and the Stran-Steel Corporation. A West Virginia family saw the home and purchased plans. Making a few modifications, the Darwin Ensign family erected a tan brick version of the Stran-Steel home in 1934. The current owner is looking for any others that may exist in the United States. 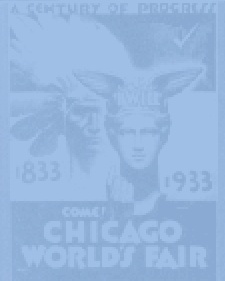 As far as she knows, there were two in addition to the original home built for the fair in 1933. Another demo home was built from the plans and displayed in Philadelphia, PA. It is unclear what happened to this home, but assumed that it was also destroyed sometime during the mid 30's. Go on to read more about the Stran-Steel home. Take the virtual Walking Tour and view the other homes showcased at the fair.